A banned driver has admitted causing a serious road smash that left a police officer and his dogs injured. John McCabe, 30, smashed a Vauxhall Corsa into a police dog van on Mowbray Road, Sunderland, on December 30. A police officer suffered broken ribs and got a shard of glass in his eye while his three dogs in the back of a van needed examination by a vet. The damaged police dog van in Mowbray Road. READ MORE: 'Sheer luck that nobody was killed' - police reveal crash driver was banned from roads until 2098! 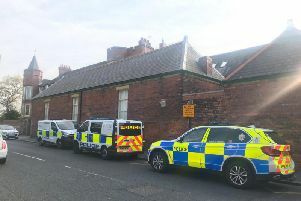 McCabe, of Fordenbridge Road, Sunderland has appeared at Newcastle Crown Court and admitted charges relation to his "ongoing incident of bad driving" that day. He pleaded guilty to offences of causing serious injury by dangerous driving, assault on an emergency worker, driving while disqualified, failing to provide a specimen, driving without insurance, two offences of failing to stop after an accident and two of failing to report an accident. Judge Paul Sloan QC adjourned the case until March and ordered a pre-sentence report should be prepared. The judge told McCabe: "I am directing the preparation of a pre-sentence report. You should understand, the fact I am adjourning sentence and the fact I am directing the preparation of a report is not an indication of the sentence that will be imposed. "The actual sentence will be a matter for the judge who hears your case on March 19. "You will be remanded in custody pending that hearing." Officers had been deployed that morning after reports a Vauxhall Corsa had collided with another vehicle before driving off. A search was subsequently carried out for the car, and while police were responding to the incident, the vehicle collided with a police dog van on Mowbray Road. Two occupants of the Corsa – a man and a woman - were taken to hospital with serious but non-life threatening injuries, along with the police officer. Police sealed off a section of Mowbray Road, near The Cloisters, after the smash. Emergency services in Mowbray Road after the smash.